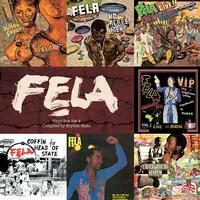 Read more about the box set and Fela Kuti's history in this engaging Village Voice profile. The inimitable Erykah Badu personally selected the seven albums featured in this fourth box set from Nigerian activist and Afrobeat musical pioneer Fela Kuti. The artwork for each album has been meticulously recreated from original album artwork, alongside vintage vinyl label artwork. • 16x24” poster designed by Nigerian artist Lemi Ghariokwu, the creative force behind 26 of Fela Kuti‘s album covers.